So the election is finally over. to invest $150 billion over the next decade in alternative fuels such as cellulosic ethanol that can be made from materials such as switchgrass and wood chips. He’d push a requirement that the U.S. by 2025 get at least 25% of its electricity from renewable sources like the wind, the sun and geothermal energy (which together currently account for less than 1% of U.S. electricity supply). If that promise comes true, then alternative energy stocks could see some good days ahead. Actually, solar energy stocks have risen sharply this week in anticipation for a Obama victory. For example, First Solar (FSLR) gained 24% in first two trading sessions this week, SunTech Power (STP) 16%, and JA Solar (JASO) 37%, etc (check out this Reuters article on sectors likely to benefit from Obama administration). In addition to individual stocks, another option (and a better one) to invest in clean energy is exchange-traded funds (ETFs). 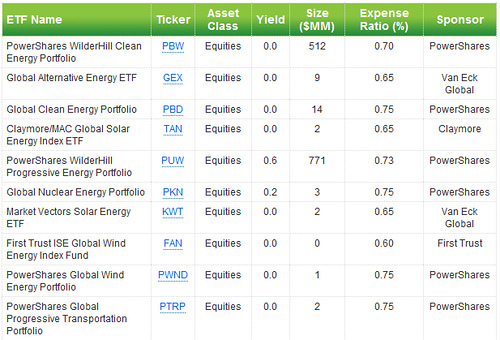 Now, using my newly discovered ETF research tool from ETFMarketPro, I found the following ETFs that invest in solar, wind, or nuclear energy. Since it’s a short list, it won’t be too difficult to identify the fund to invest. Of these ETFs, PowerShares WilderHill Progressive Energy Portfolio (PUW) and PowerShares WilderHill Clean Energy Portfolio (PBW) are the largest in assets. A word of caution when choosing which ETF to invest is to pay attention to the asset size of the fund, in addition to cost (expense ratio) and investment holdings. Early this Claymore Securities had to close 11 ETFs because nobody traded them.